Where do I start? Thank you isn’t enough for organising the most amazing few days of our lives. We didn’t think It would be possible to actually get married in Mallorca Spain, a place we had been too many times and that is close to our hearts. Matt and I both knew we wanted to have our wedding in Mallorca; neither of us wanted to wake up married in London and with a 99% chance it would be cloudy or rainy. We didn’t think our dream could come true until we met Lisa from Sunshine Weddings Spain, who told us it was definitely possible to have our dream wedding in Mallorca. Within 3 weeks of meeting Lisa we embarked on a venue tour where Tor, from the Sunshine Weddings Spain office, showed us a number of wedding venues in Mallorca and also options for our welcome party. Within 2 hours of getting off the plane we had “saved the date” of the first venue Tor had taken us to; an amazing luxury beach club in Portals Nous. As we walked in we knew instantly it was the wedding venue in Mallorca that we had always visualized. With its chilled atmosphere and the most stunning beach area over looking the Meditteranean Sea where our ceremony would take place. This amazing beach club wedding venue in Mallorca offered us everything including views out over the ocean whilst everyone could enjoy their meal, and space for a party that would go on long in to the night with a pool for a late night swim for guests who needed to cool down. The next morning we went to view the welcome party venues and we chose an amazing beach restaurant set in a cove where all you can see was the sea and the horizon. 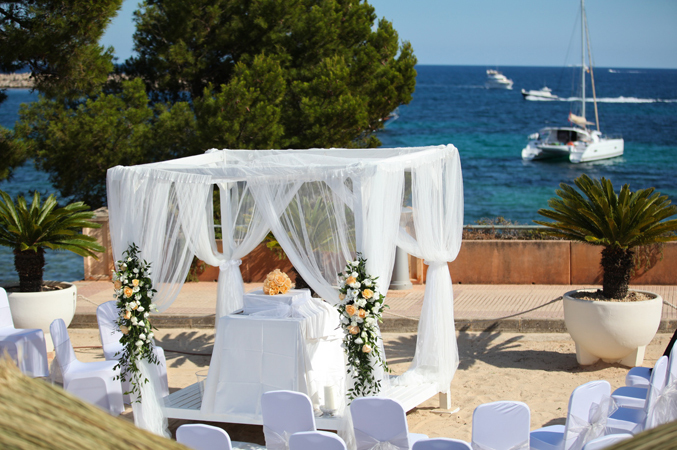 A perfect setting for our guests to become acquainted before our big wedding day in Mallorca! The final day of our venue finding trip was spent relaxing on the island, which was a lovely surprise, we thought we would be running around stressing out trying to find a venue. The Sunshine Weddings Spain team took care of everything. I don’t think once during our year of planning I was stressed at all! It was literally a case of choosing what we wanted from a list of options. We could not have done it without their help. I took 2 trips to Mallorca; the first with Matt to book everything and another trip in March, 3 months before the wedding, to do some food testing and to take some wedding favours for Tor to store in her office, which helped a great deal as we knew it would be costly to take everything over at once. Almost everything was done over email. I thought when having a wedding in Mallorca you would have to make multiple trips but this was not the case; just 2 trips in one year to sort everything. Lisa checked in with me all the time over email and was kept up to date of everything that was chosen and booked, which was so lovely. The only downside was the day and night went too quickly. We both woke up the next day and wanted to do it again!! Thank you thank you thank you to Tor, Amanda and Lisa, everyone should be organising their wedding in Spain through you! You treated Matt and I like friends and not just a client, which also made it such a special experience. We will definitely stay in touch as you all helped us have the most amazing day of lives and we are eternally grateful and will never ever forget you made our dream of getting married in Mallorca come true.